Ian was tired when we stopped at norms. I would like to think that Ian had a really good day today. Jesse had an early morning appointment up near our favorite library, so Ian and I tagged along and got dropped off while he was busy. 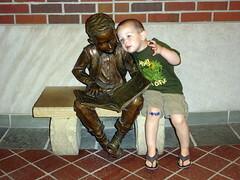 The public library is one of our favorite places to go. Not only are there books, but Ian can also play with the various toys in the youth room. Seriously, we are totally spoiled with our library. I have yet to find another one that is as great as it is. Ian ended up coming home with a few new books to read and was able to spend time playing games on the library computer. Once Jesse picked us up, it was getting close to lunch time so we all went out to Kerby’s Coney Island for some hot dogs. Well, the boys had hot dogs, I enjoyed a delicious chicken wrap. We actually had a really good lunch – we didn’t have to tell Ian to sit down all that much and he ate all of his food. I should also mentioned that he ordered his own drink. He knew exactly what he wanted and pointed it out to the server when she came by. He was really cute about it. Afterwards, the three of us headed to the Village Fair that was going on and we had a blast. I’ve already talked about that, so if you want to know more, click here. On our way back to the car from the fair, we took a break at a fountain near the public library. We noticed a few people were sticking their feet in, so we totally joined in. It was a little chilly upon first contact, but that didn’t stop Ian from hopping right on it. The water level was just high enough that Ian didn’t get soaked walking around in it. In fact, he wouldn’t have gotten wet at all if he hadn’t bent down to pick up one of the various coins that were on the bottom. Needless to say, we ended up having to change him before heading back to the car. Either way, though, it was totally worth it. 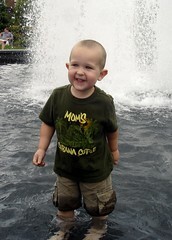 He had a ton of fun splashing in the water and tossing the coins back in. Once we got back to the car, we realized it was time to get home. We had left the house at 9:30am and it was going on 4pm and we still had a lot planned for that night. The biggest item – going shopping for Ian’s new bed set. 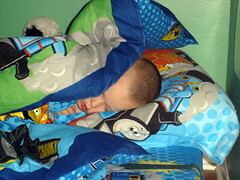 Ian has been in his toddler bed since just before his second birthday and it was time to get him in a twin size bed. Plus, I’ll be honest, Ian’s toddler bed used to be his crib and we really wanted to use it for Simon. We’ve been wanting to move him for awhile and I finally had a brain storm the other night. Our spare bed had a trundle bed stored under it that wasn’t getting used. Why not move that up to Ian’s room and have that be his new twin bed. It sits low to the ground, so if he falls off he’s not going far, and it wasn’t being used. I thought it was the perfect idea and Jesse agreed! So Ian was getting his very own twin bed and that meant we needed to get him some new sheets. After dropping Jesse off at the house to relax a little (he’s not a big shopper), Ian and I headed up to Target to check out their bedding selection. Now, I was trying to find a place that had a good selection and everything kept pointing towards Target, but honestly, once we got there, I wasn’t too impressed. Maybe I was expecting more, but they really only had about 5 different sets to chose from and all of them were trademarked characters. I was hoping for something a little different and initially Ian didn’t see anything that was catching his eye. Both Ian and I decided that we might want to check another place when we made one last run back through the aisle. That’s when Ian noticed Thomas and that’s what he wanted. I asked him, I thought we were going to check out another store, but he wanted none of that. He wanted Thomas and that’s what we came home with. So tonight, Ian is sleeping on his new twin bed with his brand new sheets with all of his stuffed animals. It took awhile for him to calm down enough to actually fall asleep (he was a little excited), but when I went to check on him later, I could barely see him. He was snuggled up and sleeping as peacefully as can be. So I think Ian had a good day today. 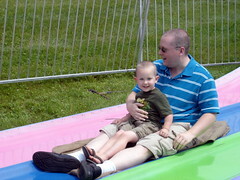 We took Ian to his first fair today. It wasn’t anything huge, but it had enough rides to interest Ian that he so didn’t want to leave. Let’s start at the beginning. When we first got there, the three of us walked to stripped, checking out what was going on. There were a few rides we knew he wouldn’t be able to do, but there were a few that he could. So we purchased some tickets and started off. 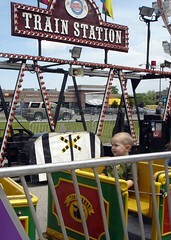 His very first carnival ride happened to be at the Train Station. The monkey does love his trains and he couldn’t resist going on it. Not only was he big enough to go on his own, but this is also the first ride he’s ever gone on without either Jesse or I will him. After that, Ian got his fix of swinging in with whatever the swing ride was called. For both these rides, he just reached the minimum height requirement (one guy had to duck down to check) and Ian was totally excited about being able to go on his own. While he was riding the swings, he was one of the few kids who wasn’t just sitting there peaceably – he kept shaking those chains whenever he could. After the train and swings, the next ride Ian wanted to go on required one of us to go with him. The Fun Slide would let him on, but considering you had to walk up this huge flight of steps, he had to have an adult with him. When Jesse first suggested hitting up the fair, he didn’t take into account that I wouldn’t be able to do a lot of the rides (if any) with Ian. So guess who got stuck going up to the top of the slide with Ian? Yup, Jesse and he’s not generally a fan of heights either. However, by the time both of them made it to the bottom, they both had huge smiles. The next ride Ian wanted…yeah, he couldn’t go on. You know those dragon boat rides that swing back and forth like a pendulum? Yeah, he so wanted to go on that, but he didn’t meet the height requirements, obviously. Plus, you weren’t going to get me on one of those things, pregnant or not. 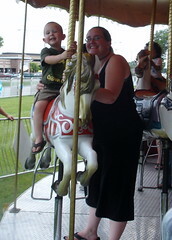 So the two of us went and snagged a ride on the carousel instead. At first, Ian was worried about falling off and me not being with him; but once I assured him I wasn’t going anywhere, he had a blast. Right across from the carousel, Ian saw something that he had to do – skeeball! According to Ian, skeeball is his favorite game and he had to play it. He’s not very good at it, but he got to roll a ball a couple of times and help daddy and I try to win something (we didn’t). After doing a few rides, we went to check out all the games that were set up. I cannot believe that it costs $3 for a single game at most of them. That’s outrageous. However, we did find one that Ian was able to do that wasn’t too bad (meaning he would come away with a prize regardless) and that was “pick a duck”. He did end up grabbing a winning duck and he came away with a new shiny ball. He even got to pick it out himself from a bunch of different prizes. We still had a few tickets left, so we went back for another round of rides. 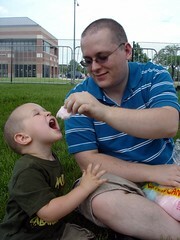 While Ian was driving the train, Jesse made a quick stop for some cotton candy. He was going to taunt Ian with it while he was on the train, but Ian wanted to sit up in the engine so he could ring the bell a few times. He really didn’t pay too much attention to us while he could do that. By this time, Jesse and I were starting to get a little tired (it had been a long day up to this point), but we still had a few tickets left. 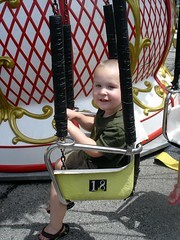 So Ian got to head back to the swings for another ride as well as the carousel. Once all the tickets were gone, we started heading back to the car. Ian did NOT want to go home. He wanted to go back to the fair and play some more. Both Jesse and I assured him that there would be more fairs this summer, that this wasn’t the only one, and he started to calm down a little. What finally convinced him that it was time to head home was the fact that we still had to go shopping for his big boy bed, but more on that in a few.